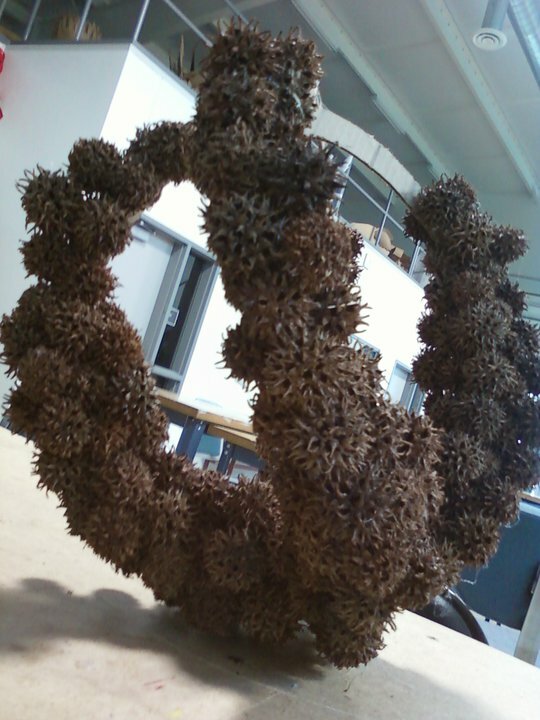 The objects (sweetgum balls) were placed together to make giant rings to represent the spheric shape of the object. 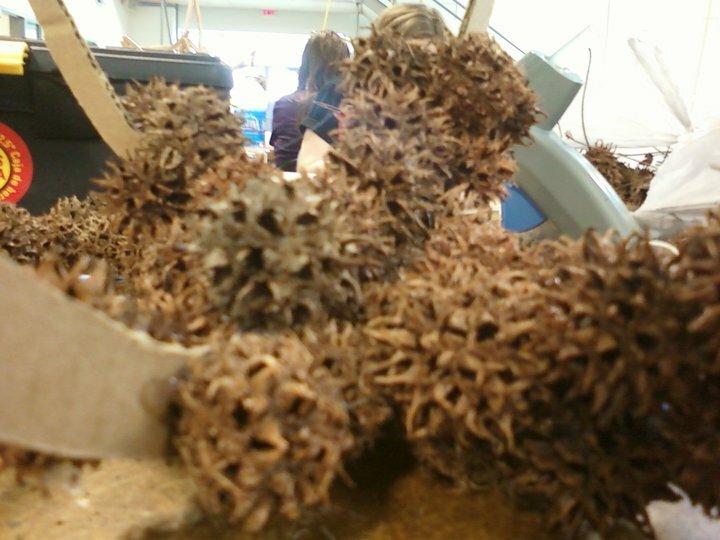 The piece could have easily been made by another object, but the texture of the sweetgum ball gave it a better image. There was no problems with the materials except for the occasional poking problem with the texture. I discoved that gloves are necessary when working with sharp material. The scale of the peice could of been bigger, but the materials seemed perfect. The peice was supposed to be perfectly circluar, but because the object weighed down the structure, it gave it an imperfect shape. It seems the final peice is more ambitious because my ideas for it changed so many times that when the final idea popped into my head, it just seemed right for it to be that way. Because the peice isnt perfectly shaped, it seems to help it; however, I'm iffy about the peice reaching for the water. I think shape and texture are the dominant elements in my peice because they play an important role to how the object appears in its surroundings. I think repetition plays a big role in my piece because of the continuing circles and sweetgum balls. The object itself is a dried out seed just stacking up on the ground and the piece shows it stacking up and reaching for water like how a seed would. Viewers probably dont look at the seed as dried out and reaching for the water and they probably dont think of the peice as stacking like how the balls do in nature every year. The piece is reaching for water so that is why I placed it by the sink. The piece responds to the water flowing from the sink so that it can be reguvanated.